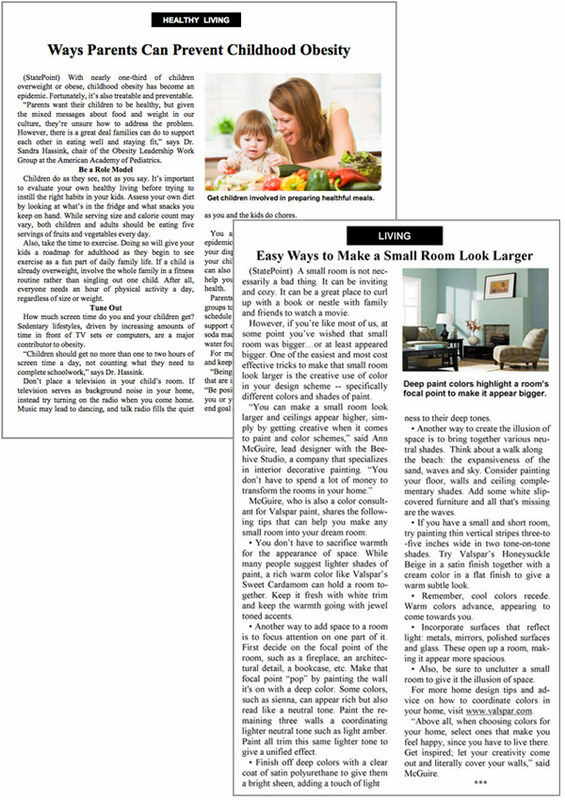 Highlight your brand in a journalistic “news readers can use” story that we will distribute and track on our content distribution network to thousands of LOCAL print and online media outlets you’re not targeting. A mat release has always been a great way for brands to garner organic media coverage. Here at StatePoint, this story type has evolved into the next generation mat release (or what we call a feature story), enabling brands to generate placements in print newspapers and on newspaper, TV and radio station websites across the country. You can also include our Content Amplification service to drive more targeted clicks and social engagements to your story (learn more). We’ll work with you to develop feature stories that provide readers with tangible “news they can use” – a format that allows your brand to be positioned as a trusted expert. Our journalistic approach, combined with our content distribution network, allows us to target local media outlets and online influencers across the U.S., positioning your brand as a thought leader in front of a valuable demographic – middle to upper-middle class consumers living in suburban and rural communities. A typical story is approximately 500 words in length, adheres to AP Style and includes a photo at no extra charge. We can include hyperlinks in your editorial copy and even incorporate your SEO keywords. Every story we develop follows two simple rules: it has broad appeal and provides readers with information of value. A StatePoint feature story goes well beyond the traditional mat release and provides significantly more value than other forms of sponsored content. You can distribute a story on any topic at any time or in one of our timely special packages below. Each Feature Story includes print and online distribution. Additionally, you can include our Content Amplification or Spanish Translation & Distribution to reach an even larger targeted audience. In addition to 1,100 – 1,300 media placements and 150 million audience reach, each feature story comes with the deliverables below.